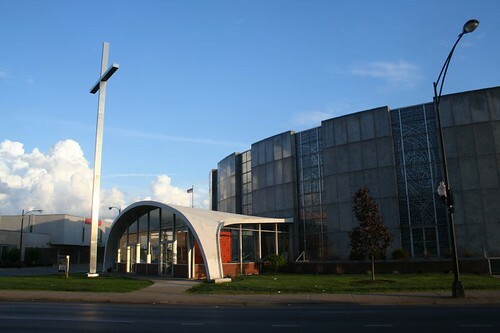 When I was a child we'd drive past St. Gall's after visiting my grandmother at 47th and Kedzie. The bold orange baptistry really stood out! I remember my mother saying how this church "was something else" when it was built. You have to remember, this was built before the Second Vatican Council. A church like this was not something the devout middle class Poles in Gage Park (or Catholics anywhere, for that matter) were accustomed to! Wow! I wandered here after seeing your pics of the condemned Washburn Trade School on Flickr and lo and behold, you have a blurb on my Grandparents' parish of St. Gall! Many memories of walking to this church with them and then to Lindy's down the street for a Sundae afterward. Keep up the good work! wow. . . this is quite a blast from the past for me. Thanks for these photos. I went to St. Gall's from kindergarden through the 8th grade. My mom pressured me into saying I wanted to be a nun and for many years, I went to daily mass, was the pet of the nuns and prayed a whole lot in that church. I was very seriously, in my childish way, about my spiritual life. I am no way Catholic now . . . but I was very seriously about my religious life back then. 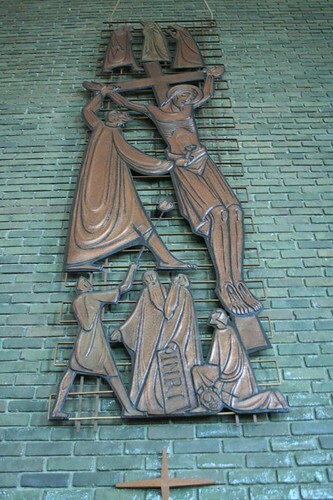 And I deeply loved our modern church, its modern windows, its modern stations of the cross and taht beautiful baptismal thing with the gold. I deeply loved the bluegreen bricks. I believe our parish was very up to date and the modern building reflected it. I was so proud that I went to such a special church and this pride was specifically connected to the building's architecture. The building had a very meaningful impact on my religious practice of the time. 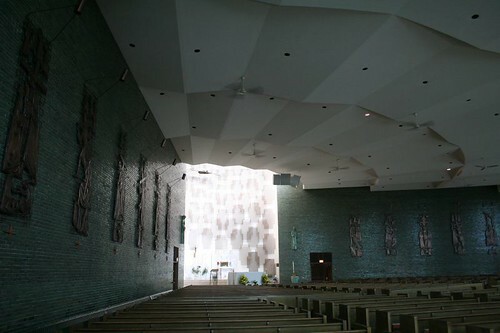 My father, William Pavlecic and his partner, Rodoslav Kovacevic designed St. Galls. He is still alive and practicing architecture in La Grange, IL. Mr. Kovacevic is now deceased. Jack Ota was the architect of record, as my father was sitting for his exam at the time. 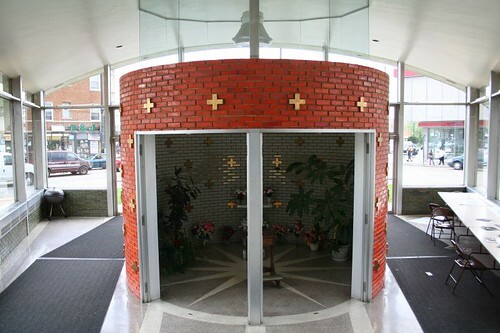 The modern granite building with a quarter circle nave and baptismal font at the entry was inspired by a series of lectures given at Notre Dame. My father was moved by major points of the seminar which discussed placing the alter at the focal point of the mass. 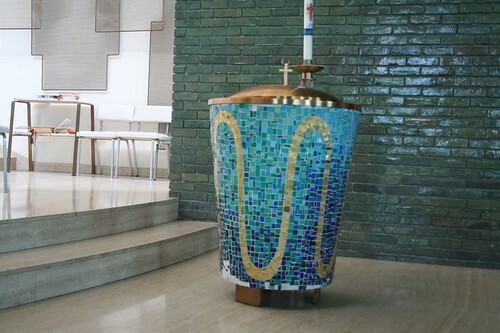 The now removed baptismal font was placed in the front narthex to symbolize entry into the Catholic Faith. 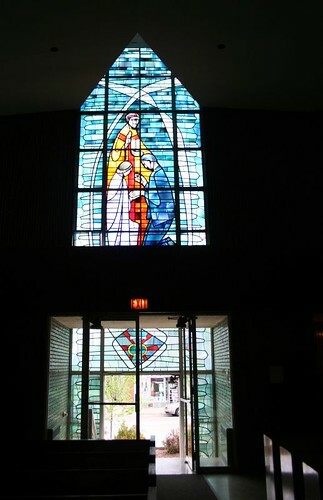 The Stain glass windows are amongst the largest in the city and surround one of the largest naves in Chicago. The choir loft is equally immense and provides a spectacular view of the interior. The pipe organ is amongst the finest; though my father is still bothered by the crack in the terrazzo floor which overlays the conduits leading from the keyboard in the back of the church to the altar. Another building by Pavlecic and Kovacevic is the former Brookfield Federal Savings and Loan, now Citibank at 9009 Ogden Avenue Brookfield, IL. Its plan is a full circle with exterior stainless columns and beams, glazed brick and a mezzanine hung from the exterior frame. The round cash vault and cantilevered stairs are exquisite. My father’s work inspired both by sister and I to continue in the trade, as we are both licensed architects.